Another Halloween has come and gone. Pictures will be up really soon along with video and this time I mean it because I actually have them in my possession for a change. However, I am dead tired after all this, so it will have to wait till I’m a functional human being again. Pumpkins on Pendrith was a huge success. We had lots of compliments. It was a totally different experience for me, as I used to simply add to an existing theme and this year I changed it up entirely. There were no tombstone or coffins. It wasn’t meant to scare. It was meant to delight and it definitely did. Children loved it, but more than anything, adults were blown away and that means so much to me. Getting thanks for bringing this to their neighbourhood is one of the many reasons I do this insane thing every year. I bring something to families that they may not otherwise see. For one evening I bring others joy. It is a wonderful feeling. The aches afterwards are not though! 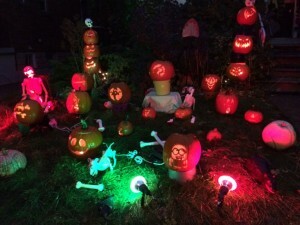 Mom – You are by far the most giving person I know and your help with Halloween was exceedingly appreciative. I don’t even know what else to say about all you have done. You are my hero. You put others before yourself always and that is an amazing trait. Plus, it was your idea to do a whole pumpkin theme. Dad – You helped as well. You gutted so many pumpkins! You carried things and put up with me when I was freaking out over various things. Year after year you help me. I am very grateful. I could not do this without the support you and mom give me! Mike – You know you are with the right guy when he’s willing to shave off his beard because it doesn’t go with his costume! (Please grow it back now). You have always helped me with my insane hobby and I couldn’t be happier that I am slowly converting you into a haunter! Thanks for everything Wreck-It-Mike! Rosie – My six year old niece informed me that she feels the movie Frozen is overdone. That right there earns you major points! Instead of being some stupid princess, you were the most awesomest vampire I have ever seen. And you were a wonderful candy hander-outter! Sam – My 10 year old nephew. For the first time, you carved a pumpkin all on your own and not just any pumpkin. I challenged you with a stencil and you took it on. You were patient and it turned out great for your first time! I would also like to thank my brother-in-law Marc for not killing me for taking over his house! Isaac – my 3 year old nephew. You didn’t help with anything, but you were the best Dr. Octopus ever! And lastly, the people of Pendrith and surrounding streets. Thanks for your words of kindness and for donating to The SickKids Foundation. I loved hearing your stories about what your kids loved from last year and I was surprised they remembered it. You are one of the reasons I do this. You keep me going. With that I must go put my cell in a bag of rice after it landed in a ginormous puddle. Did I mention it was freezing and raining all day? Check back for video and pictures in the next little while. I want to put together a nice video, but I plan on getting it does soon.